I feel so much pressure from the geek community to partake in the misadventures of The Good Doctor, but as of yet I haven’t partook… partaked… partaken. I think I’m saving it for one of those rainy days when I crave British accents and time travel (usually a Wednesday). Seeing as how I don’t have a proper frame of reference, I can’t comment on Matt Smith being cast as the eleventh Doctor Who. If you are blessed with an opinion on this matter, feel free to share it in the comments. Re: “Who’s On First” – I know it’s a lame joke and I’m sure someone else has already used to to poke fun at Doctor Who, but it made me smile. Having never seen an episoded of Doctor Who, I can’t very well make a subtle reference to some obscure faneurysm like I would normally do. If you know the classic “Who’s On First” routine, might I suggest “Who’s On Stage“? 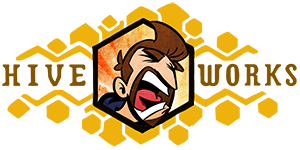 Also, if you enjoyed THE TASTEY ADVENTURES OF BACON MAN or currently enjoy pining for your favorite cancelled show, you’ll be happy to know that HE-Friend-Comic “Save Hiatus” is back. Posted in Uncategorized and tagged doctor who, scifi, tv. The Special that revealed him didn't give any long enough looks at his past acting work, but I'm optimistic. And I'm actually glad Tennant is leaving, I've gotten tired of him. Half the country was sat around on Saturday waiting for The News to end so we could hear who it'd be. Then this ..complete nobody.. popped up on the screen, and the collective "WTF?" of the nation could be heard from space. He's such a weird looking guy. His appearances in other series haven't been really outstanding.. Just pretty, "Okay." But with Moffat in the driving seat, great things will probably happen. If not, I've got a huge stack of Pertwee and Baker archives packed onto my HD. A geeky look at a classic joke. Love it! Believe it or not, I think they only use the joke once or maybe twice a season. But yours was very well done because it ended in violence. LOL. Thanks for this. I've seen probably 15 or 20 episodes from the last run of the doctor. It's actually pretty damn cool, if a bit goofy. But that's all part of the fun. I don't watch Dr. Who (I like it, but have no TV, and frankly no time), but he looks like a certain emo sparkly vampire. Meaning I will never be able to watch Dr. Who episodes with him in it without going "TIME LORDS SPARKLE IN LE SUNLIGHT! I AM LE EMO VAM — TIME LORD WHO LIKES REALLY YOUNG GIRLS!" (Extra visual here: http://unamaga.livejournal.com/274014.html).Ahem. Anyway. They are different actors, in case you hadn’t noticed. And I am not holding my breath. At least he’ll get a chance of decent scripts now that Russell T. Whoopsie has stepped down as lead script-cocker-upper. 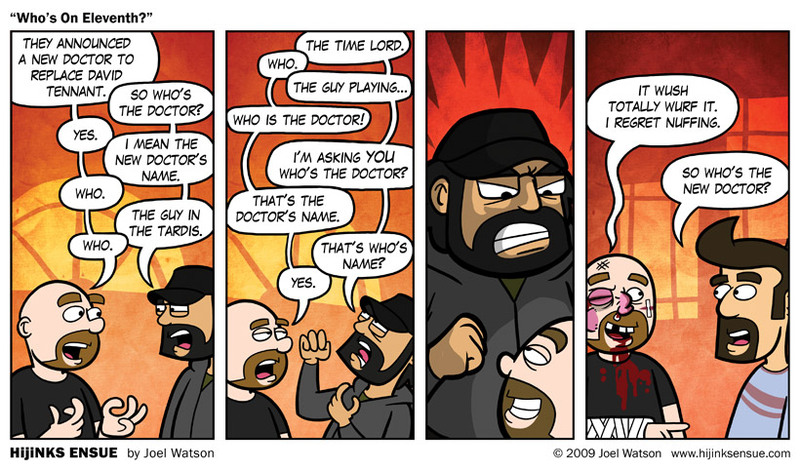 I don’t watch Doctor Who either, but today’s comic is awesome. Pissed off Eli has a lot of intensity in his eyes. On an unrelated topic. Bacon. Thank you. Don't watch, but my friend who spends her entire life devoted to the many iterations of that show and, more importantly, the hypothetical banging of every doctor way back to the black and whites is going to lose it. Well, until she realizes she wants to bang the new one too. Oh and thanks for the heads-up about Save Hiatus being back. Doctor Who and Abbot & Costello in one comic! My dream come true. Seriously, that is awesome. Haha, gotta love the "Who's on first" routine, a timeless classic. As for Dr. Who, Ive seen a couple episodes and even though I had no clue what was going on I still enjoyed them. The thing is the show has been on for so long that to try and start from the beginning and catch up seems too overwhelming to me. I think one of the charms of Doctor Who is that it's relatively easy to jump into. He's got a TARDIS for time travel, which we don't know much about, he's got a sonic screwdriver which is some techno-magi multitool, which we don't know much about, and the doctor himself, despite the fact that he's a time lord, 900+ years old and regenerates, we don't actually know much about. So if you know those basic facts you probably know as much as you need to keep up. Story arcs, such as they are (and really they're usually just clues to the season finale) tend to be limited to a season so the start of a new season and the start of a new regenerated doctor is probably a good time to pick this up. Sorry if I sound unimpressed, Who fans – I'm a Brit myself, but Battlestar Galactica this is not. Except the police box is from the 1950s and he can't travel through his personal time line and thus can't go back and change things. Plus, the doctors aren't really getting younger, before 11 was cast 5 was the youngest. Which means 6-10 were older than 30 at least. So it's ok not to be into Doctor Who but at least get your facts straight. Sorry. It just occured to me how incredibly lame it was to correct a minor point on a post made over three and a half years ago. I love the new (as in 2005>) Who, but personally don't bother with the fuss about 11. He's not Ecclescake or D Ten(nant), but so what? That's the whole point of regeneration. New face, new teeth, (still not ginger) new companions even. I'm sure we'll get used to Matt Smith, even Ten was so fantastic and I miss him already. Though Eccles was fantastic and I miss him too. I'm sure if I'd watched the old, rubbish shoestring-budget rubber suit monster-show, I'd miss the previous Doctors as well. Ya, boo for him still not getting to be ginger. They really shoulda made that happen for the ol' Doc. I was really hoping that Paterson Joseph was going to get it! He was the rumored front-runner for MONTHS, and as soon as I realized who they were talking about it seemed like a stroke of genius. This new guy looks like someone from those new happy-emo bands that are popping up everywhere these days- Panic At The Jonas Fall Out Brothers Rejects or something. I have no real problem with the new Doctor being so young and an unknown because it does give us a fresh start post-Tennant and it'll be unfair to make any such comparisons simply because Tennant was simply outstanding. Plus they're bringing Rose back to add some familiar counterweight to this unknown actor. My only concern though is they may have done the same thing as BBC did with Merlin and cast a young kid to connect with the younger audience. It was a mistake with Merlin, even though it's pre-legend stuff, and could be a mistake here. Just as long as they don't make too much of the emo hair style we should be OK.
Where did you get the idea they're bringing Rose back?! While I'd love it to be true, I haven't heard it, can't believe it. I'm sure this kid's going to be fine, especially with Moffat at the helm. Maybe I misheard, maybe the rumour mill is going mad! I think what could work really well is playing off the fact that here is this 900 year old genius alien and nobody takes him seriously because he looks about 12 years old. That could be interesting. Looking forward to a new Doctor though Tennant was absolutely Wizard, as Donna Noble would say. The stuff they did in the last season – laying on new background while not making it seem forced, having it often stay goofy and fun then suddenly turn serious – it is an excellently written show. Long as they do that, it'll be good. Whatever happened to the concept of not looking for spoilers! It was enough of a spoiler knowing that Tennant was leaving, but I certainly am not going to go look up facts on his replacement, not until I've actually seen him in action as the Doctor. But this had no spoilers in it, so I don't have to hurt you. Yes, you should definitely go watch Doctor Who, preferably as soon as possible. Haha great stuff, showed this to all of my friends who like Doctor Who. None of us are really crazy about the new casting and all agree he's kinda funky looking (well except one friend but she doesn't have the best taste in things). None the less, I'm gonna give the new guy a chance and see how he does. I'll miss Tennant but all good things must come to an end. I had never heard of Doctor Who for most of my life. Some friends of mine introduced me to the show and we had approximately that same conversation, but more confusing and with less violence, as I tried to figure out exactly what was going on. I now watch Doctor Who when it's on (and nothing else is) and have given up trying to have it explained to me in favor of reading the Wiki, which is also very confusing (but informative!) and guaranteed to give you bizarre dreams. I like David Tennant, mostly because his facial expressions are extremely interesting and he has a was of delivering a funny line in a serious manner that makes it 5x as funny as it should have been, but I'm willing to give a new guy a chance. Sorry for this bit of geeky nerdiness but the Doctor's name isn't "Who". It's just the Doctor. It's only the program that's called Doctor Who. There. Now I can go and wash my hands pi times. BTW the regeneration excuse to replace actors is one of the better plot devices I've seen in SF programs. It is, ahem, ahead of its time. As for getting into Doctor Who, I'd recommend starting with the Christopher-Ecclestone-as-the-Doctor episodes. The seasons before that one really show their age. I want to give this guy a shot….. but that haircut makes me cringe. Forget Emo – he looks like a complete dork. Seconded. The kid needs a lawnmower. It makes me wish they had in fact, as completely unfounded rumors once hinted at, gone with Eddie Izzard. Make-up, sequins and ginormous heels, yes. Enormous greasy-Cousin-It hairstyle, not quite. That being said, I'm sure it'll all turn out to be quite wonderful. I wasn't sure about the switch from Eccleston to Tennant either, but there you go. Still, Paterson Joseph would have been favorite. "At first blush? Watching this youngster talk I can’t help but see his hand gestures, and think “wibbly-wobbly, timey wimey…”, I'm willing to give hima try, and I've suffered thru bad docs before, If he's bad they can always kill him off and replace him, the Joy of regeneration. “wibbly-wobbly, timey wimey…” is my #1 most quoted Who-ism. "Blink" FTW!!! Dr. Who seasons 1-3 are on Netflix "Instant Watch" which you can stream through your 360 or to your comp, so you truly have no excuse for not having watched it. So get on it!!! Join with us!!! Become one with the Who-tinuum!!! Dunno, I really felt Matt Smith as the Doc. 'Course, I saw the whole last season and it had it's usual goofiness (I calls 'em the Dipshit Spots I does I does), but on the whole it was pretty damned good. Just waiting for the next serial to start rolling. That, and my local cable provider to start running the Beeb in H-effin'-D.
whomight and yoube sketch from Duckula "no sax please, we're egyption" is ace is you liked the above. There is a huge gap between the 8th and 9th doctors, 9th being Eccleston. They actually did a semi-reboot this way, and if you look it up the 2005 series is considered 'Season 1', so it's the perfect place to start. As to Matt Smith, I don't entirely mind him, but he feels like a letdown after David Tennant. Matt tries so incredibly hard to be a new, different doctor, and alot of it comes out forced.